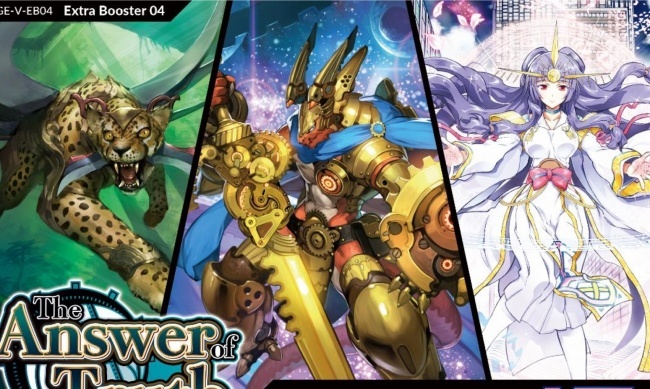 The new year will begin for Bushiroad’s Cardfight!! 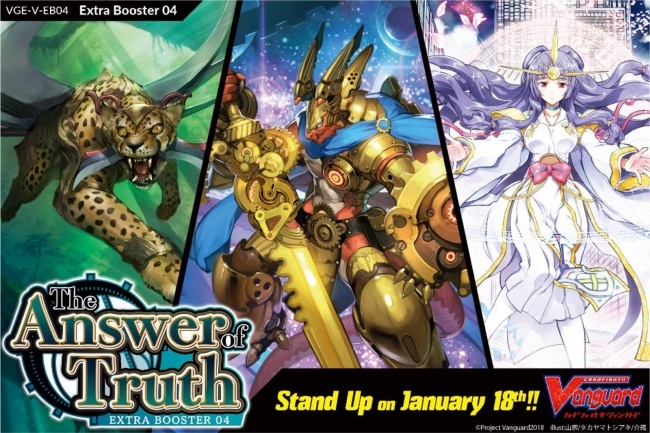 Vanguard trading card game with the release of The Answer of Truth expansion on January 18. The Answer of Truth Extra Booster expansion is intended for experienced players, and features cards for the Gear Chronicle, Genesis, and Great Nature clans, including new trigger units and vanguards. The set has a total of 68 new cards and 6 parallel cards, including a Gear Chronicle parallel OR card with all-new artwork. The rarities for the cards in the set will be 3 VR, 6 RRR, 8 RR, 14 R, and 37 C. There will also be 3 SVR parallel cards and 3 OR parallel cards. The expansion will be sold in 7-card booster packs, and each pack will have 2 cards of rarity R or higher. Boosters will be packaged in 12-pack display boxes, and each box comes with a pack of 3 Gift Markers, one each of Force, Accel, and Protect. Stores that wish to participate can host a pre-release event January 11 – 13 by ordering The Answer of Truth Sneak Preview Kit, which comes with 39 booster packs, 9 promo cards, and 2 copies of a premium rubber playmat. This is enough material to host an event with eight participants. The new expansion will follow the Ultrarare Miracle Collection expansion, releasing in December (see “New Rarity Added to ‘Cardfight!! Vanguard’”).